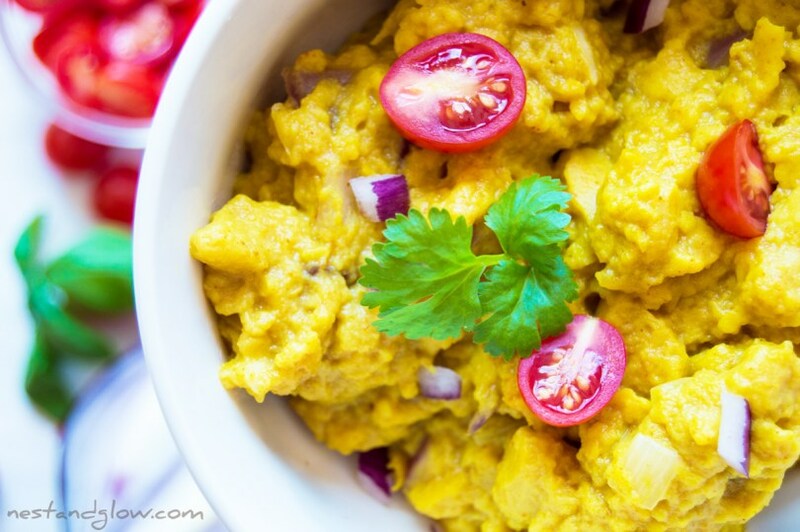 This high protein vegan scrambled chickpea “eggs” has a similar taste and texture to normal scrambled eggs. It’s quick, easy and cheap to make using home made chickpea tofu. Don’t be put off if you don’t like normal tofu as this soy-free chickpea version is different. Suitable for vegan, egg-free, dairy-free, grain-free, oil-free, gluten-free and soy-free diets. The star of the show is the Kala Namak / black salt. This is a common ingredient in many Asian foods and gives the dish that sulphur eggy taste. If you like the taste of normal eggs then do use the salt, if you prefer the texture of eggs and not the flavour then omit it. Kala Namak can be bought in many Asian shops where it’s inexpensive. More information in the paragraph at the bottom. Mix together the chickpea flour, turmeric and smoked paprika with a third of the water into a paste. Bring the other 2/3rd of the water to a simmer with a pinch of salt. Mash the chickpea tofu in a pan and then add the remaining ingredients. Cook for a few minutes until all the broth is absorbed and serve. 0 Response to "VEGAN CHICKPEA SCRAMBLED EGGS"